Join us to learn raw edge applique, then use your machine's decorative stitches and your imagination to permanently secure your pieces to your block. 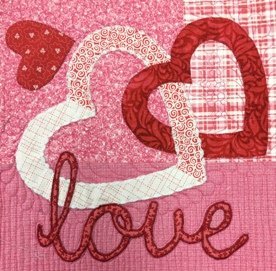 Add a little free motion quilting and embellishments and you will have a completed, themed 14" block from the booklet "Art to Heart: Imagine" by Nancy Halvorsen. Use the blocks individually or join them together using a quilt-as-you-go technique for a finished wall quilt.